The Passamaquoddy Tribe’s battle with the State of Maine over Native fishing rights became an interstate issue recently when New York State authorities lodged multiple felony poaching charges against a Passamaquoddy fisheries official who is helping the Unkechaug Indian Nation implement its eel management plan. But according to Fred Moore III, the Passamaquoddy Tribe’s Fisheries Committee Coordinator who was charged, the fight for Native fishing rights is soon to become a bigger issue than the battles in Maine and New York. Moore, his two sons and five other Native men, including citizens of the Unkechaug, Shinnecock, Mohawk and Anishinaabe nations, were charged with possession of American eels in excess of the New York State limit; possession of undersized American eels, and not having a state-issued food fish permit. All three charges are considered felonies because the value of the eels in the group’s possession was more than copy,500. They were also given misdemeanor charges of conspiracy to commit a crime and using an eel trap with a mesh size smaller than the minimum limit allowed, according to Lisa King, spokesperson for the New York Department of Environmental Conservation (DEC), in an e-mail response to an ICTMN request for comment. King said the eight men “surrendered themselves” to DEC officers on April 8. She did not respond to questions seeking the state’s position on tribal sovereignty and aboriginal fishing rights. The men are scheduled for arraignment on June 25. The Passamaquoddy Tribe has been locked in battle with the State of Maine for the past two years over the tribe’s treaty and aboriginal right to fish for elvers, tiny baby American eels also known as glass eels. Citing concerns about the dwindling number of American eels available, the state wants to limit the number of permits the tribe issues. The tribe says every member has an inherent right to fish, but its conservation plan limits the total amount of elvers the tribe can harvest. Ironically, until this year the state limited the number of permits it issued but allowed an unlimited harvest of baby eels. This year under threat from the Atlantic States Marine Fisheries Commission (ASMFC) to shut down the fishery, the state has caught up to the Passamaquoddy’s traditional conservation knowledge and reduced and limited the total allowable catch. Moore, who is working at Unkechaug under tribal authority, told ICTMN that the matter of Native fishing rights is soon to become a central issue for eastern coastal nations. The Penobscot Nation is already embroiled in a federal lawsuit against the State of Maine over hunting and fishing rights. The lawsuit is supported by the Interior Department, which has entered the case as both intervener and plaintiff, and the Passamaquoddy Tribe is thinking about intervening, Moore said. In an interview with ICTMN, Passamaquoddy Chief Clayton Cleaves at the tribe’s Sipayik community, said the council will also consider a separate legal action. The ASMFC, created in 1942 by Congress, represents 15 Atlantic coastal states with a stated mission of “promoting and protecting Atlantic coastal fishery resources.” Each state has three representatives on the commission: the director of the state’s marine fisheries management agency, a state legislator, and an individual appointed by the state governor to represent “stakeholder interests,” according to the organization’s website. The United South and Eastern Tribes’ 26 member tribes, whose aboriginal and reservation territories are predominantly along the Atlantic coast, are not represented on the commission. Moore said he wasn’t fishing on the night of March 28 when the men were ticketed for violations, but that the group had fishing permits issued by Unkechaug. The DEC was alerted to the group’s activities in a creek on Long Island’s east end and waited in the weeds for the tribal members to come back and start emptying their nets of elvers, Moore said. If DEC authorities hadn’t “pounced” on the group, Moor added, they would have seen the men stock most of the elvers above artificial barriers—which is one of the conservation techniques he is implementing for the Unkechaug. The creek is in Unkechaug aboriginal territory, where members exercise aboriginal fishing rights, Wallace said. 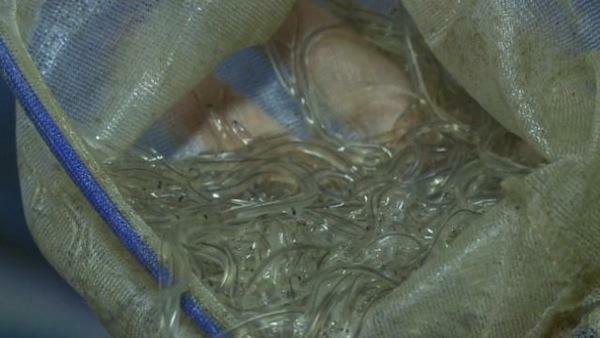 New York State allows a massive taking of eels six inches and longer, but prohibits the taking of elvers. The tribe has imposed a moratorium on the taking of adult eels, each of which can spawn tens of millions of elvers, Wallace said. To date, the Nation has successfully stocked more than 10,000 glass eels into Mill Pond and East Mill Pond at the headwaters of the Forge River adjacent to the Unkechaug Indian Reservation near Mastic, New York, said Wallace, adding that the DEC violated its own policy by filing felony fishing charges against Nation members and employees operating under the authority of the Unkechaug Nation American Eel Management and Restoration plan without first consulting the Nation. The Nation is contemplating legal action against the state, Wallace said. On April 17, Chief Clayton Cleaves and Chief Joseph Socobasin of the Passamaquoddy communities at Sipayik and Motahkomikuk, respectively, wrote a letter of “support and commitment” to Wallace. “Please be assured that your efforts to secure the rights and interests of your people while ensuring the sustainability of the American eel within their natural range will benefit all Native people on the east coast, including others who do not understand the cultural and spiritual relationships we have developed over several millennia of existence within our territories,” they wrote. This entry was posted in News, Top Story and tagged aboriginal fishing rights, Elvers poaching, Native Americans, New York, Passamaquoddy Fisheries, Passamaquoddy Tribe, Tribal Sovereignty by Kim Kalliber. Bookmark the permalink.